Common Windows Problems and Solutions - Some Windows 7 problems are the issues caused by its own features. They are so irritating and required to be fixed ASAP. Some of the most commonly reported problems in Windows 7 includes "Windows cannot install updates," Video Lagging, booting time, slow performance, software reliability & compatibility, "Problems installing recent updates," hardware failure, DLL errors, even with themes and its features. But how to fix my Windows? How to fix Microsoft Windows update issues? Recently I have published that might help you; 7 Ways To Speeding Windows Boot Time Up By ​‌‌‘​‌Turn On Fast Startup’ Option. Everyone knows Windows. And when you dealing with Windows OS; troubleshooting Windows problems becomes a part of your tech life. Windows 7 was a major update in terms of speed & performance which offered many additional features to its users. Though it was known for better speed and performance still there come certain Windows 7 bugs and fixes with it too. These issues require certain fixes to make the system run smooth. In this article, I'm going to discuss top 10 Windows 7 issues and solutions to improve the system performance. This way you can also optimize and speed up windows 7 system. Learn quick solutions to fix windows problems. Last time you have seen; Top 6 Tips to Speed Up, Optimize & Improve Windows PC Performance and today we are going to see some but most important Window problems and their solutions. 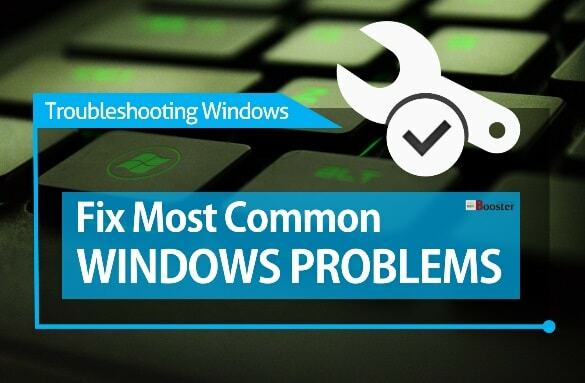 Today here I'm going to share most commong bugs and quick steps about how to repair & fix most common Windows 7 issues and updated solutions that will help you to optimize, speedup windows & improve your PC performance considerably. 1. DVD drive not found. In most of the cases, it happens when your system may not found DVD drive & your CD or DVD drive is not recognized by Windows even when it's visible in the BIOS and using the standard drive. The standard solution to deal with the situation is to run REGEDIT. Solution: To do so press Windows logo + R and type 'regedit' in the Run dialog box. In the navigation pane, locate and browse to following registry subkey: HKEY_LOCAL_MACHINE\SYSTEM\CurrentControlSet\CONTROL\CLASS\, then delete both LowerFilters and UpperFilters in the right-hand pane. Alternatively, you can use the hardware and device troubleshooter by going to Start button >> Control Panel >> Hardware and Sound and click Configure a device option. Troubleshoot video card problems - Due to various visual effects, your graphic card and system memory can start creating problems for you. If you feel sluggish system speed you should think of turning off superfluous effects. Solution: To do that go to Start button >> Search for Performance >> Select Adjust the appearance and performance of windows >> this way performance options window will open. Select Visual Effects >> Adjust for best performance. Solution: Try to do it by going to Start button >> type Aero >> now, click on 'Find and fix problems with transparency and other visual effects' link >> fill in administrator details and click Next to launch Aero troubleshooting wizard. This way it will try to find and resolve the problems. If it doesn't try to install latest driver for graphics hardware. To enable some Aero Features Run 'regedit' and browse to HKEY_CURRENT-USER\Software\Microsoft\Windows\DWM and change EnableAeropeek value to 1 from 0. 4. Windows 7 theme changes your custom icons. Customize Your Icons in Windows 7 - There can be certain side-effects of installing new themes on Windows 7. Your new theme pack icons can replace your original system icons. Solution: To prevent this situation right-click anywhere on the empty part of the desktop >> Select Personalize >> Change Desktop Icons >> Clear the "Allow themes to change desktop icons" and click OK. This way you can preserve your icons which can be changed only from the same Desktop Icons dialogue. Fix Your Windows 7 Taskbar - New Windows 7 taskbar can be problematic for few people as it doesn't clarify whether the icon on it is running a application or a shortcut is pinned. Solution: To restore more standard taskbar buttons right-click the taskbar >> Select Properties >> and set Taskbar Buttons to 'Never Combine' or 'Combine when taskbar is full'. Sometimes it happens when your important folders like Control Panel and Recycle Bin doesn't display on the left-hand Explore pane. Solution: To fix it launch Explorer and click Tools >> Folder options and check 'Show all folders' >> Click OK and all your primary system folders will reappear. Fix, show, add, remove specified Control Panel applets - When you install Windows 7 you may not find important applets like Mail, Photo Gallery, Movie Maker etc with it. To download these programs, you may need to go to Windows Live Essential site. Even installing Live Essentials will get you lot of unnecessary extra programs like ActiveX, Live Sign-In Assistant, and others. Solution: To deal with the situation you can safely remove these extras from the Control Panel >> Uninstall Program Applet. Fix dmp file and blue screen error - Minidumps (memory images saved when your system crashes) can be useful to restore or troubleshoot crashes. But if you are not interested in such troubleshoots then it is the waste of precious storage space. Solution: To get rid of this Run 'regedit' and browse to HKEY_LOCAL_Machine\system\CurrentControlSet\Control|CrashControl and then set MiniDumpsCount to 1. This way you can direct the Windows to save only last dump file to free up disk space. Show or hide file name extensions - Explorer's default settings hide file extensions and system files and folders in Windows 7. Solution: To fix it launch Explorer and click on Tools >> the go to Folder Options and click on View. Next, clear the 'Hide extensions for known file types' to Show File extensions. Troubleshoot audio problems in Windows 7 - You may face sound issues or some other issues with your DVD system on Windows 7. Solution: To deal with DVD audio issues go to Control Panel >> Hardware and Sound >> Sound >> right-click on current default playback device and select Properties. Next click on Advanced >> clear any settings in the Exclusive Mode box and click OK. Following these simple steps, you can prevent many Windows 7 problems and manage to get rid of them. You may encounter with many other problems too like duplicate files on your system which cause system performance issues as these files occupy lot of disk space. To deal with duplicate file issues you can use duplicate file finder tools. Rest all you need to do is to do a little research on other topics to find a solution for them.